It's a snowy day here in Charlotte, however we luckily didn't get as much snow as they predicted last night. On a scale of dusting to complete mayhem, we are right around "slight snow mixed with grocery store madness." Last night Ian ventured out for necessities (cheese and baby Motrin) and said the grocery store was a madhouse. So we are staying put and staying in. I do think a little hot chocolate is in our immediate future. 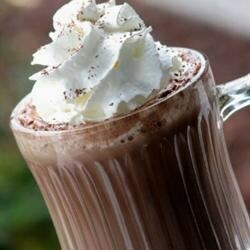 I have some cocoa powder -- here is a recipe for hot chocolate from scratch. Yum. Around this time last year is when Ian and I took our babymoon to Boca Raton and Miami, Florida. Our resort's sister property had a Serendipity onsite, the cute little sweetshop known for their frozen hot chocolates. So, if your temps aren't in the 30s like they are here in Charlotte, here is the copycat recipe for Serendipity's piece de resistance (even loved by Oprah). Stay warm loves, and see you here tomorrow for Five On Friday! We're heading to the same resort next month! Any tips on what to do and where to eat? Enjoy your snow day! That frozen hot chocolate looks amazing!! Yum!! I'm going to have to try this out ASAP!! I'm in Oklahoma where the snow has melted but we are expecting more this weekend and temps in the teens now. This is my go-to hot chocolate recipe also, so delicious! You've made me want to make some this evening, stay warm girl! Oh my! I may have to try that recipe! 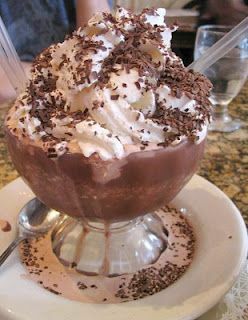 When we were in NY back in December I made sure to snag reservations at Serendipity and end our meal with some yummy frozen hot chocolate!! SO SO GOOD! I love Serendipity! I'll definitely need to try and recreate at home - hope you're staying warm!